As in any place where the Home is present, here in Chone, the 8th of September was also a special day. We celebrated Our Lady's birthday as the occasion called for. 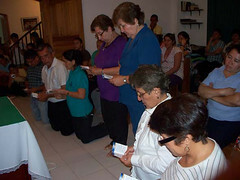 In the afternoon, all of the members of the Home who were going to renew their commitments or were going to enter in the Home for the fisrt time, got together for más a 7:30pm. What a joy it was to see the whole side wing of St. Cayetano's full of Home of the Mother t-shirts. 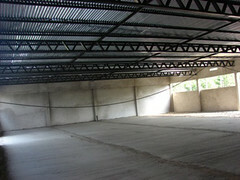 Not too long ago we had a week of vacations in the school, and it has been useful to continue working on our much waited for assembly hall. The hall continues in construction, although it is going pretty slowly because there are only two workers besides Demetrio, our "fix-it-up" man. On Sunday, September 12th, a group of young people gathered together at the "Maria Elisabetta" farm to have a get-together. 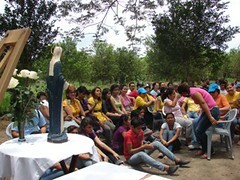 More 30 young people came from Playa Prieta with the Sisters, making a great effort, because they had exams the following week. Some of them even brought their books with them to try to study in their free time. At the school in Playa Prieta, the 8th of September was a great feast. 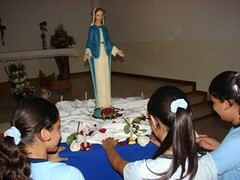 The children usually have Mass together at the school on Monday, and we thought about moving the Mass to Wednesday to celebrate Our Lady's birthday. 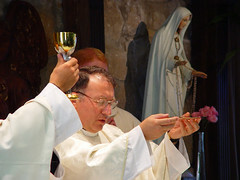 The High School students surprised us with this request: "Sister, do not change the Mass, on Monday get a priest to come and celebrate, and then, we can go to confession to be able to receive Communion on Our Lady's feast day!" What a great joy! Monday a priest came and stayed a while after the Mass, but, as some were left without confession, on Tuesday another priest came to continue hearing confessions. 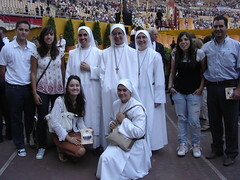 On September 12th, the feast of the Holy Name of Mary, Sisters Ana Maria and Mercedes attended the beatification of Fray Leopoldo de Alpandeire, which took place at the Armilla Air Base, outside Granada (Spain). Everything seemed to give evidence that it would be very hot that day. At a quarter to six in the morning, when we left Alcalá de Guadaíra (Seville) it was 78.8ºF (26ºC), and the sun was shining pretty nicely on the square where the beatification took place. You can now join in our ceremonies by Webcam! 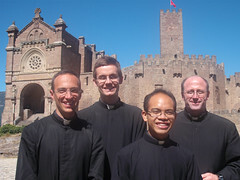 We are all aware of what a grace it is to be able to participate in the Home of the Mother ceremonies, such as the vows of the Brothers or the Sisters, the entrance of candidates into the Novitiate, special celebrations like the Pontifical Approval of the Home...However, unfortunately, this is not always possible due to the fact that we live far away, or we have to work, or our health does not allow us to travel, etc.